Start by assessing your monthly energy cost. Are you using more energy, therefore spending more money, to heat and cool your home than your neighbors? If this is the case, your roof may be on the road to failure. The cause is most likely inadequate roof ventilation. This is when heated air is trapped with nowhere to dissipate. Insufficient ventilation can also invite moisture, which can absorb into your insulation reducing its effectiveness. Let’s travel down to the floor under the attic. Keep an eye out for any discolored spots in your home’s ceiling. If you observe darker spots that can leave behind a residue to the touch, you may have the beginnings of black mold. A helpful tip is to follow your nose. Does the room give off a distinctive mildew smell? Is the air musky with earthy notes? Does the air quality remind you of wet and rotting autumn leaves? 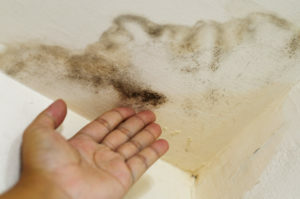 These are all indicators of black mold. This deadly mold can put you and your family at risk for respiratory issues, nausea, and excessive fatigue. If you discover water damage that resembles any of these items listed, your roof has been compromised and needs to be replaced immediately! Next, head outside with a ladder to review the condition of your roof and shingles. Explore your roof. Are there any shingles that appear dirty with dark stains? Are there slightly green vegetation patches like algae or lichens? Though unsightly, this is not necessarily destructive to your roof. 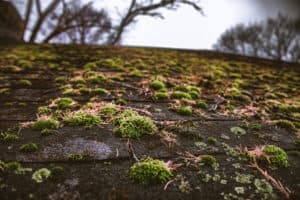 Shingle wear and algae growth are key signs for determining the age of your roof. Older roofs will inevitably, at some point, need a full roof replacement. Continue the review of your roof, scope out for any loss of shingle coverage. Are any shingles clearly cracked, curled or warped? Are the shingles securely in place? Are there any exposed nails? Is there any loss of coverage to your roofs flashing? Does your roof sag or droop in certain areas? 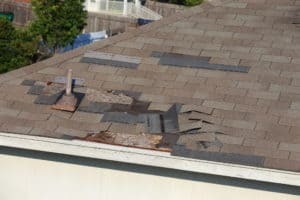 Any and all of these issues are red flags for your necessity of a full roof replacement! Why did your roof fail? Homeowners are often not privy to the current condition of their roof. That’s why it’s always important to get a roof inspection every ten to fifteen years, or when you’re purchasing a new home. But what causes a roof fail? The answer is generally either storm damage, substandard materials or poor workmanship, on a part with the contractor who last worked on your roof. Often, bargain contractors will hire inexperienced scab labor installation crews who often forgo critical steps in the installation process to save time and cost. A less competent contractor is more likely to make careless mistakes like mis-aligning your shingles or using inferior roof underlayment. They may neglect to add a drip edge to your roof, or use improper installation techniques for nailing, caulking or flashing. All of these can create problems even after installation is complete and that contractor has moved on. If your home’s roof has fallen into disrepair, give Thompson Creek a call at 301-960-5786 for a no-obligation quote for a total roof replacement! All Thompson Creek exterior products are professionally installed by experts using our proprietary installation methods while providing the highest quality roofing materials to ensure your roof will outlast our warranty. I like how you mentioned that you should take a hose to your home in sections to pinpoint the source and figure out where the water is getting in. Every time it’s rained recently, my windows have leaked. I will definitely utilize your tips to help fix my leaking windows. Thanks for pointing out that an ill-functioning window is likely also costing you money in heating and air-conditioning. I recently noticed that one of my ground floor windows has a crack in it, and it’s not that big but I think that it’s still letting in more air than I would like. I think I’m going to call a company that can come and repair the glass so that I don’t have to worry about it getting worse. Receive all the latest blog posts directly into your mail box. Thompson Creek Window Company is the Mid-Atlantic region’s premier home improvement replacement products company.